Rope bags offer essential protection to your climbing lines or rigging ropes. Rope bags make it quick and easy to store rope without tangling it, and using a rope bag on the job can keep twigs and branches from fouling your climbing line as it deploys from the bag. See here for throw line storage bags. Small Rope Bag by Sterling New in 2019! Made of durable nylon, these rope bags come equipped with top handles, a bottom that's grommeted for drainage, a clear front pocket, and a single shoulder strap. 17 liter capacity - fits 200' of 3/8" rope, or about 110' of 1/2" rope. 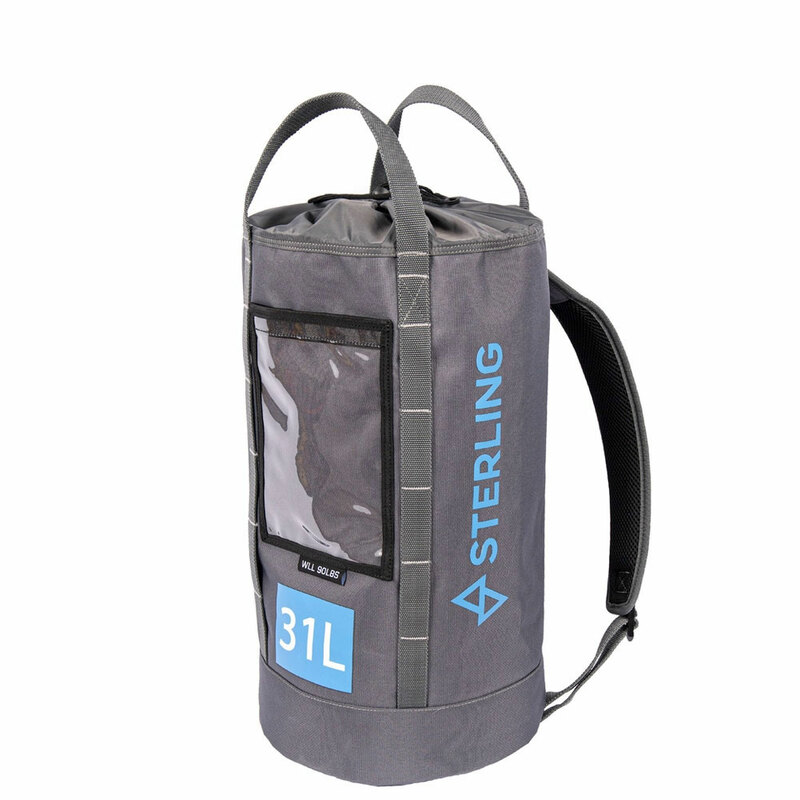 Medium Rope Bag by Sterling New in 2019! Made of durable nylon, these rope bags come equipped with top handles, a bottom that's grommeted for drainage, a clear front pocket, and adjustable shoulder straps . 31 liter capacity - fits 200' of 1/2" rope. 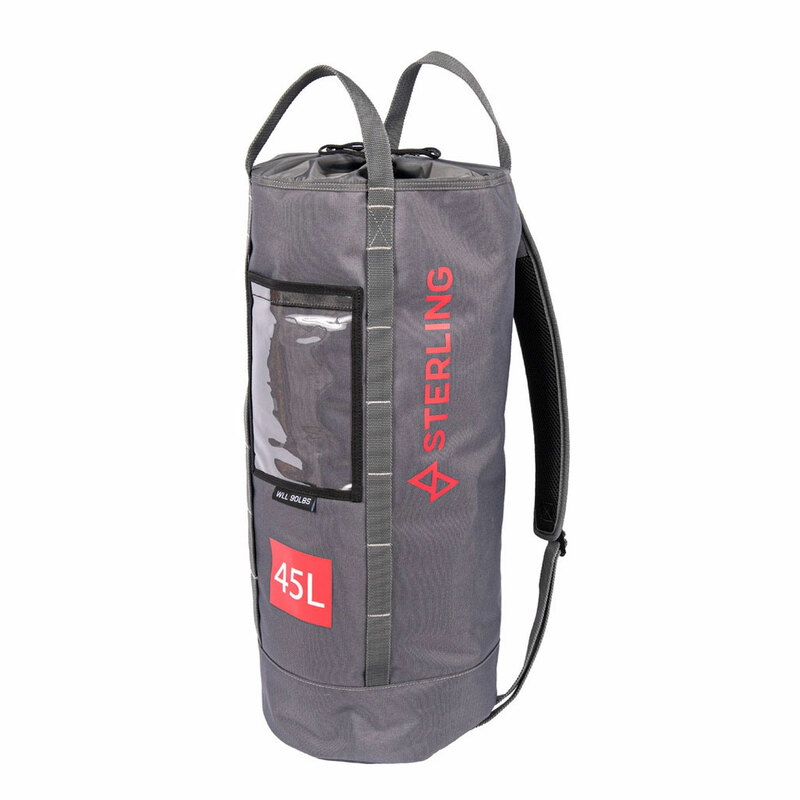 Large Rope Bag by Sterling New in 2019! 45 liter capacity - fits 400' of 1/2" rope. A versatile, heavyweight, and feature-rich gear bag with an impressive 50kg (110lb) load capacity! With a large 65 Liter capacity and 50kg (over 110lbs) max load, Arbortec's Cobra is a great all-around gear bag. The Cobra is highly customize-able, with a removable internal divider at the base of the bag that makes it easy to organize your kit. It also features a removable rope bucket, which can be taken out and used as a separate bucket. Two large side pockets and a large mesh pouch pocket help organize smaller items. 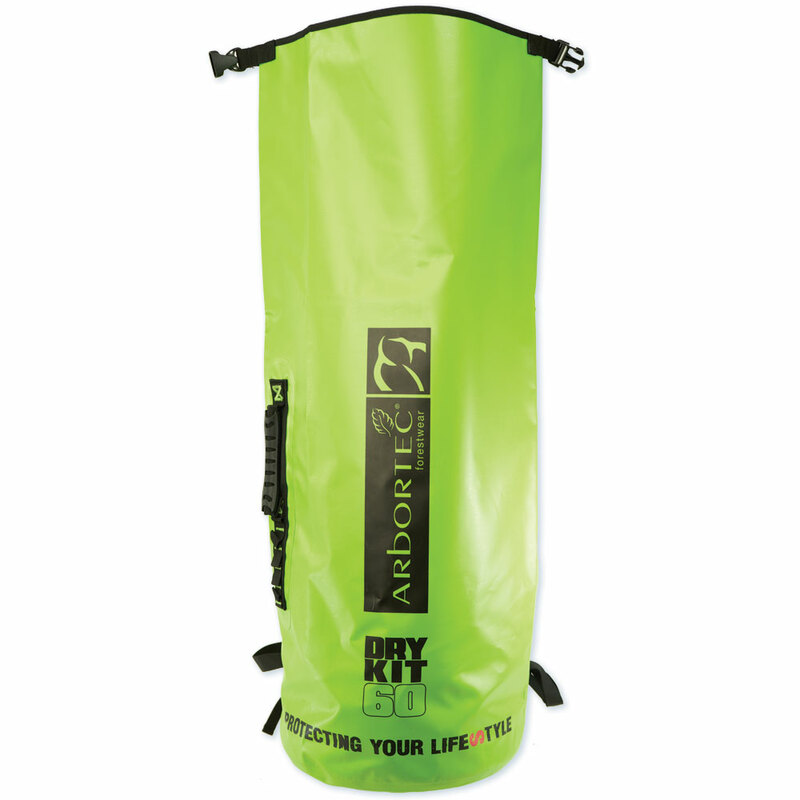 Viper Rope Bag 60l by Arbortec New in 2019! Waterproof rope and Rope Bag made from welded PVC/PES tarpaulin material, with roll and clip top for a IPV4 watertight seal. An adjustable, removable rucksack harness made from soft and comfy 3d Airflow mesh makes hauling heavy gear or long treks more comfortable. New Tribe Rope Bag - Medium New in 2019! Protect your rope and organize your gear with New Tribe's rope bag. Measures 12" wide x 11" high, fits 150' of 1/2" climbing rope. Reinforced rims and sides so that the bag stands open for easy rope stuffing. Made from 1000 denier nylon canvas and firm webbing for stiffness and durability. Pack cloth top with drawstring closure, carry handles, steel ring at rim, and webbing loop inside at bottom. Rigging bag features a center rope bag that fits 300' of 1/2" rope with drawstring opening both ends. Big 8" x 4" x 20" side pouches hold slings, carabiners, pulleys, and other rigging gear and buckle around the center rope bag to keep gear and rope together in one package. Top handle and backpack straps, and heavy-duty Cordura construction. Lifetime guarantee. Made in the U.S.A. The Reach Rigging pack is the ultimate back for hauling rope and hardware in organized pack. Say goodbye to hauling multiple bags and digging through them looking for the right piece of hardware. With the Reach Rigging pack you can carry up to 300' of 1/2" rope in the center chamber, and organize your carabiners, pulleys, belay devices and other hardware in the giant side pouches. This bag is perfect for organizing the gear of the professional climber and cutting down gear clutter. If you don't fill the center chamber with the full 300' capacity, the Reach Rigging pack can easily fit 150' of rope, a compact saddle, and helmet. Made in the U.S.A.
Great for remote work sites and recreational tree climbs. Padded shoulder straps allow you to wear your rope on your back, leaving your hands free. Functions like a top-notch rope bag with stiff walls, drawstring top, and exterior pockets. Backpack rope bag fits 150’ of 1/2" rope. Buckingham takes the Ergovation concept of ergonomic, heavy-duty work gear and applies it to gear bags. These bags have removable waist belts with thick back padding which cushion the lower back and help support the load. Simply fantastic for long hauls with heavy gear! Made in the U.S.A.
Small bag features: Heavy duty construction, Twin daisy chains along back of bag, Draw-string top, Padded shoulder straps, Cushioned back support, Removable waist belt. Buckingham International is a new line of imported gear bags designed to Buckingham's specifications and rigid quality standards. These gear bags offer great utilitarian performance at a nice price. Features water-resistant fabric, 1 1/4" rope access port in lid, heavy-duty lid zipper, web loops for extra carabiners, exterior pockets, lid cap that keeps dirt and water out, zippered ventilation panels, webbing gaps for tool clips, and separate shoulder straps for backpack carry (shoulder straps are sold separately). Rope Pro Deluxe LG holds 120' of 1/2" rope, plus saddle, helmet, and more! 16" tall x 12" wide. Rope Pro Deluxe XL holds 250' of 1/2" rope, plus saddle, helmet, and more! 24" tall x 14" wide. Petzl's rope buckets are fabric packs which remain upright for easy rope-loading and have an exterior folding lid system that allows easy access to the contents of the bag. The Petzl buckets are loaded with external zippered pocket, transparent window for gear ID tag, large carrying handles, adjustable webbing for carrying the bucket over the shoulder, a lined bottom for a longer service life. The Petzl Buckets are made from waterproof fabric. The Petzl Eclipse Throw Line storage fits perfectly inside the Bucket when the Eclipse is folded. A simple and lightweight haul pack with unpaved pack straps, side handle, and cordlock top. PVC-free heavy-duty vinyl construction keeps gear dry. 15 liters. Fits a Petzl harness & helmet & PPE or similar gear, or 120' of 7/16” line. 18" tall x 13" across. Durable, medium pack with padded shoulder straps, side handle, and secured upper flap for water-proof transport. Inside loop for hanging bag in open position. 30 liters in volume. 25" tall by 16" across. Large haul bag with padded shoulder straps and waist belt for comfortable transport of all your gear. Welded construction, cordlock closure and upper flap which secures with 2 snaps keeps your gear secure and dry. Side and top handle, upper loop for hauling, and inside loop. 45 liters in volume. 26" tall by 18" across. The smallest of the Teufelberger bags are the Kit Bags. The 25 liter bag will fit inside of any of the other bags. 25 l bag measures 12.5" x 14.5". 30 l bag measures by 12.5" x 16". The largest of the Teufelberger rope buckets. The 80 liter bag is the largest, and any of the others will fit inside of it. 50 l bag measures 20" x 17". 80 l bag measures by 26" x 17". Large and strong, the DMM Transit rope buckets will take 30 and 45 liters each. The DMM rope buckets are the perfect companions for your ropes in the workplace, giving ease of storage and carrying ability whilst keeping ropes clean and safe on site. DMM Rope and Tool Bags Information Sheet - PDF file. The DMM Porter range of bags will take 45 and 70 liters, with a moulded back panel and substantial carry system. They are designed for carrying loads over greater distances than the Transit bags. The Porter also has a detachable waterproof lid and heavy duty top handles. This enormous gear bag can carry a complete climbing gear setup with room to spare. Lots of great features including numerous pockets, snaps for gear, mesh sides to prevent rope molding, and comfortable backpack style straps A great bag for rope and gear. Strong construction with one flat side and two shoulder straps. These bags can be carried like a bucket or on your shoulder for heavy weights or long distance walking. Stiff-walled, reinforced rope bags, are one of the best ways to protect your climbing and rigging lines and deploy them quickly. A rope bag will keep your line from tangling on twigs and sticks. 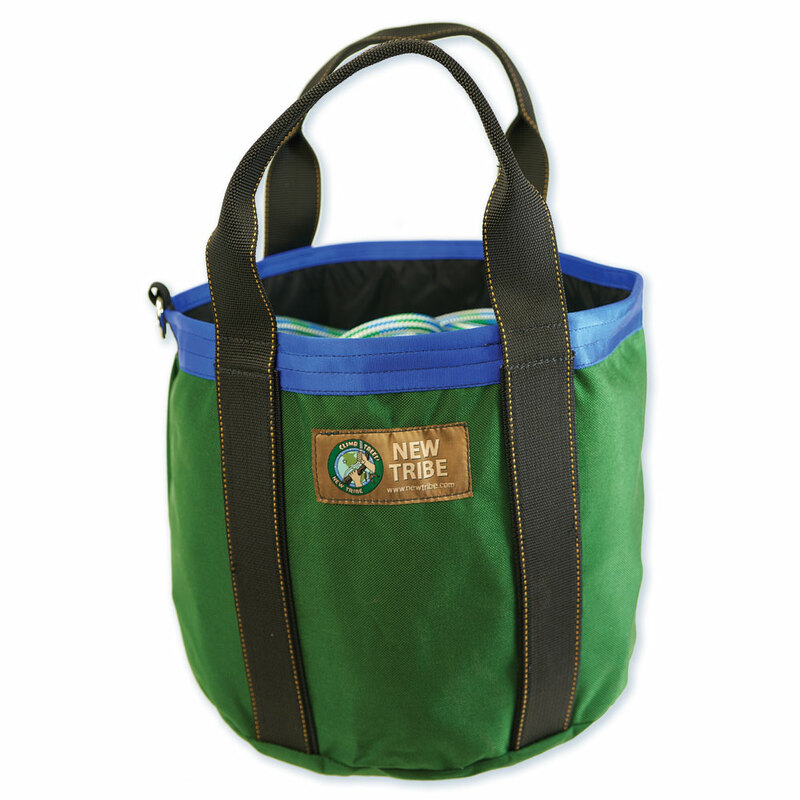 Features sturdy, reinforced handles and drawstring closure to keep out debris. Small rope bag fits 150’ of 1/2" rope. Made in the U.S.A.
WesSpur Rope Bags - How much do they fit? This large bag will hold over 300’ of 1/2" rope and will hold plenty of larger diameter rope. Good for rigging lines. A rope bag will keep your line from tangling on twigs and sticks. 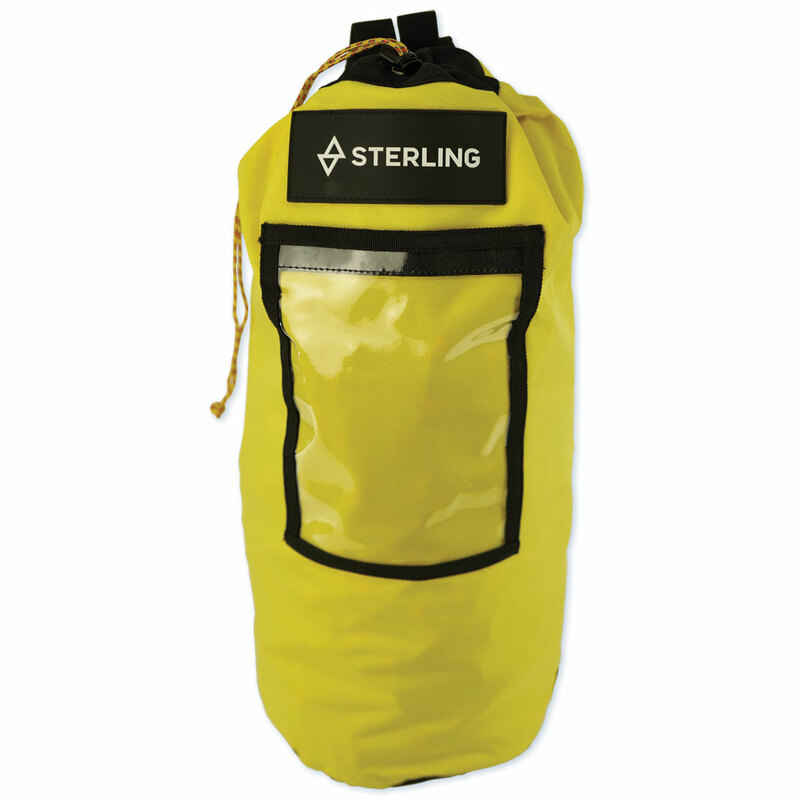 Features sturdy, reinforced handles and drawstring closure to keep out debris. Made in the U.S.A. This giant rope bag is our largest, fitting 500’ of 5/8" rope or much more of a smaller diameter line. Available with exterior pockets for slings, gear, and other things, or a streamlined bag with no pockets. Great for rigging lines. Features sturdy, reinforced handles, drawstring closure to keep out debris, exterior pockets and heavy duty construction, including an extra layer of rubber on the bottom. Made in the U.S.A.